This 1949 novella about the violent expulsion of Palestinian villagers by the Israeli army has long been considered a modern Hebrew masterpiece, and it has also given rise to fierce controversy over the years. Published just months after the end of the 1948 Arab-Israeli War, Khirbet Khizeh (the 'kh' pronounced like the 'ch' in 'Bach') was an immediate sensation when it first appeared. Thousands of Israeli Jews rushed to read it, the critics began to argue about it, and a Palestinian journalist in Nablus described it as a sign that the Israeli army had a conscience and that peace was possible. Since then, the book has continued to challenge and disturb. 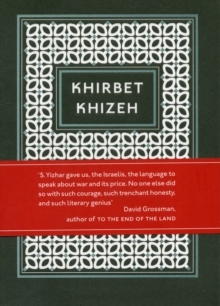 The various debates it has prompted would themselves make Khirbet Khizeh worth reading, but the novella is much more than a vital historical document: it is also a great work of art. Yizhar's haunting, lyrical style and charged registration of the landscape are in many ways as startling as his wrenchingly honest view of one of Israel's defining moments. Despite its international reputation, this is the first UK publication of Khirbet Khizeh.